The Synod Youth Work Action Group have exciting news for you. 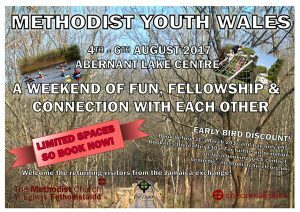 On the weekend of 4th – 6th August 2017, we are holding the first METHODIST YOUTH WALES ACTIVITY WEEKEND. As you are aware, there has been a great deal of success in the recent Youth Exchange to Jamaica. Nine young people from Wales travelled to Jamaica to experience new cultures and customs, share time and space in a new environment, and explore their own faith on a bigger map. This event is coupling with the return visit of ten Jamaicans to Wales to experience in this country, all that the Welsh young people were able to in their time away. This entry was posted in News, Youth on February 17, 2017 by Lisa Medina.